The judging system of figure skating is always criticized when the world focuses its eyes on our sport at the Winter Olympics. This year, an article on NPR has already popped up about a judging scandal in the team event. The article essentially is saying that judges colluded backstage on the team event. Articles like this continue to arise, despite the fact the judging system for skating has been completely redefined and any and all opportunities for one judge to change the outcome of an event have been removed. The fact articles like this keep popping up is most likely due to how confusing and complicated the system currently is. The best way to diffuse people thinking judges are these evil, malevolent beings that have all the control is to teach people how the system works. Due to my experience judging skating competitions, I understand the rules and how the changes impact the sport. So, let me shed a little light on things. Skating always historically used the 6.0 judging system, where judges would award a score from 0.0 – 6.0 for each skaters technical and artistic mark. If you watched the greats like Michelle Kwan (my personal favorite), this is the scoring system you are used to. 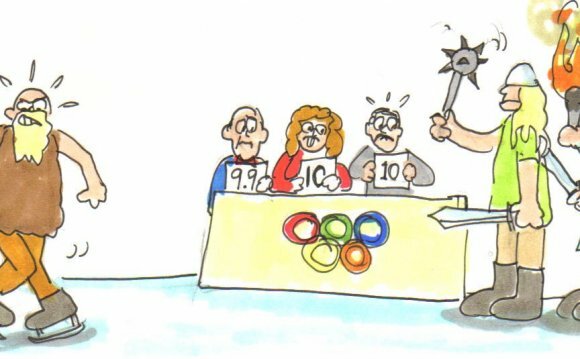 This judging system was very easy to understand (and therefore spectator friendly), but made the sport 100% subjective to the judges on the stand. Having skated and judged under this system, the 6.0 system is rich with history, but posed a lot of challenges to judges and skaters alike. In 2002, with the judging scandal at the Salt Lake City Olympics (read the article for more details), the judging system came under fire. What resulted was the new International Judging System (IJS). IJS is incredibly complicated, but is a lot more fair to the skaters and actually works in their benefit. The IJS system moves judging from being 100% subjective, to 60% subjective, 40% objective. There are two panels on the ice: the judging panel and the technical panel. The technical panel is responsible for assessing what the skaters do on the ice so the appropriate amount of base points can be assigned to the skater. Each jump has a base point value, and spins and footwork sequence have different levels with base points that skaters attain based on the level of difficulty performed. In the pursuit of assigning the correct amount of base points and properly assessing what the skater performed that day on the ice, the technical panel has the ability to watch videos of each and every element performed in slow motion to make sure they are fair. Three officials determine what the skaters do on the tech panel, and in the event technical specialists disagree with a call, they take a vote. This is what makes up the objective portion of the figure skaters score. The judging panel is responsible with two tasks: 1) assessing the level of quality of the technical elements performed and 2) assigning the components marks, which are the marks based on the skaters skating skills, choreography, and overall program performance. When a skater performs an element, the tech panel gives the base value, but the skater isn’t guaranteed the base value of points. The judges assign grades of execution (GOEs) to each element performed that range from a -3 to +3, and the grade of execution by the majority of judges is used as a factor that’s ultimately multiplied by the base value of the jump. The best way to describe this is to use an example. Let’s say two different skaters perform a triple lutz jump. One skater falls on the jump, and the other lands the most beautiful jump you have ever seen. Ot doesn’t seem very fair that the two skaters receive the same base point value. The GOEs make it so skaters are rewarded (or penalized) for the quality of elements they perform.